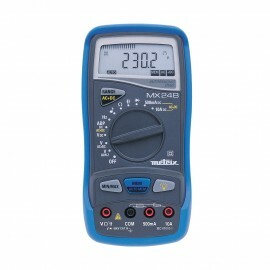 The MX 24 is the 5,000/50,000-count TRMS digital multimeter of reference in the MXCONCEPT range. Equipped with an ADP input, it can be connected to a variety of accessory probes: luxmeter, current clamp, thermometer, etc. • Dimensions 170x80x35 mm, weight 300 g.